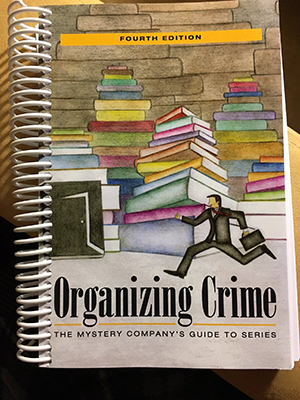 When you walk through the bookroom at one of the many crime fiction conventions worldwide, you just never know what you might discover. You could stumble upon a first edition of that book you love, a signed copy of a new bestseller, or a book to help you keep all your series books organized. What’s that you say? A book to organize books? Well, yes, actually! Let me explain. Crime fiction readers love their series reading. There is something so comforting about cracking the spine on a novel in which you know you will be visiting with some friends you made across the course of time. But this comes with a “price.” Most readers are neurotic enough that they (ie. we) insist on reading a series in the correct order. And with hundreds of new series books published every year, it can be almost impossible to keep track of what is available, what has already been read, and what new series one might want to try. That is where Organizing Crime comes in. 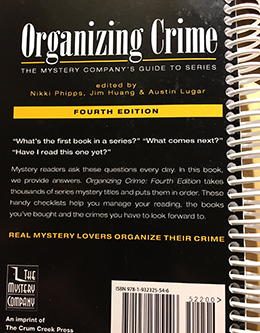 This resource will prove invaluable to those readers who love series crime fiction. Listed alphabetically by the author’s last name, this volume makes keeping track of those concerns so much easier. 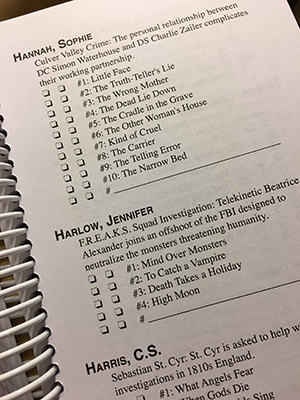 You can see from these sample pages that each entry begins with the name of the series detective (or in some cases the location or series name) and then lists each book in the series in chronological order with two tick boxes next to each title. 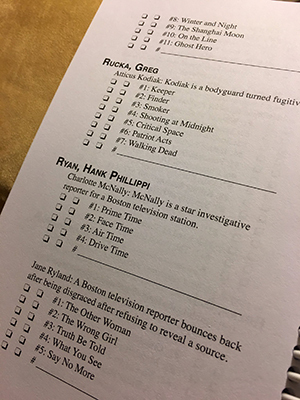 These tick boxes are not labeled, so readers can use them in whatever way they like (probably one “for purchased” and one “for read” is the most logical). There is also room to list new, as yet unpublished, titles in each series as they are released. 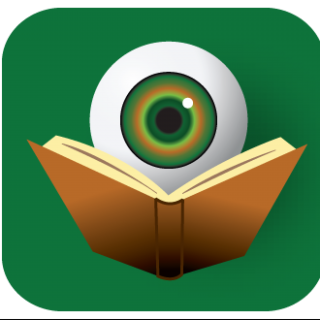 I suspect that most series readers have already stopped reading this and are off ordering this very handy resource, but if you are still here – hop on over to Crum Creek Press and get to ordering. You won’t be sorry. Disclaimer: A print copy of this title was provided to BOLO Books by the publisher.